As if the X-Men franchise was not complicated enough, what with spin off Wolverine and more to come, we now go back to basics with a prequel set in the 1960’s, complete with reasonable period detail. 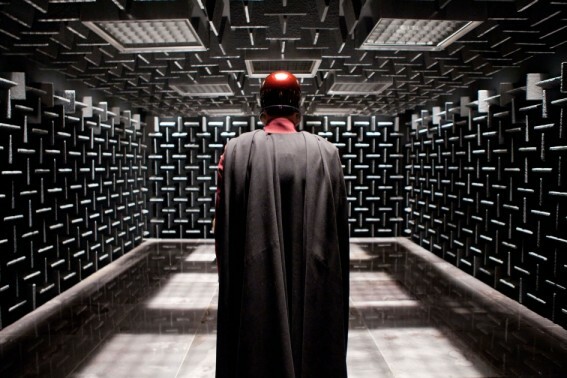 The film starts, not unsurprisingly, with the cause of Magneto’s reason to hate. Mother and young son are swept up in the persecution of Jews, led by a scene stealing Nazi doctor, Sebastian Shaw. Kevin Bacon, an inspired and unlikely casting choice for this particular role. Whether such background material is suitable for a pure entertainment film, is perhaps debatable but the opening scene is strong and very effective. Perhaps anything that makes a new generation hit Wikipedia to find out more, is no bad thing. Erik Lehnsherr/Magneto (Fassbender) has every intention of enjoying his revenge stone cold and follows the ex-Nazi trail through South America and ending with an early standoff with his nemesis. There follows a very effective SFX scene with a quite spectacular use of a super yachts anchor chain, possibly the most realistic CGI sequence in the film. The story switches to Charles Xavier (James McAvoy), initially using his telepathic powers to seduce women in leafy Oxford, whilst attempting to persuade his sister Raven/Mystique (Lawrence) that turning blue occasionally is really not the end of the world. Charles and Erik come together in an uneasy friendship, following Erik’s doomed attempt to kill Sebastian and his henchwoman Emma Frost (January Jones), a character that struggles to keep her clothes on throughout the film. The pair come to the attention of the CIA via agent MacTaggert (Rosie Byrne), who discovers mutants led by Sebastian, are keen to push both the USSR and USA towards World War III. A task made easier as the Cuban missile crisis looms large with the very real possibility of nuclear Armageddon. The CIA initially are somewhat reluctant to trust the mutants, but subsequently realise their potential and place them under the very loose control of MIB agent (Oliver Platt), who happens to have a ready built facility for just such an eventuality. The team recruits more mutants and soon we have, Beast (Hoult), Havoc (Lucas Till), Darwin (Gathegi) and Angel (Kravitz) in training for the coming battle ahead. The film is a risky move, prequels or reboots are not always successful; certainly we have a talented cast, good script and competent director in the form of Matthew Vaughan. The studio knows that a successful restart should spawn at least another film, if not two. On the basis of this film they need not worry, this as good as it gets for a comic book reboot. X-Men never intended to emulate the moral complexity and darkness of the Batman franchise, the series always represented a brighter, more colourful world and that tone generally continues here. There are certainly plenty of scantily clad women to attract the target audience but they do get some decent screen time and something to do, notably Jones and Byrne. There is occasional humour to lighten the mood and Fassbender and MacAvoy make a good job of recreating the characters we already know. Bacon is a stand out, especially in the earlier scenes, although there is the faintest whiff of Austin Powers as the story progresses but this is a minor quibble. The film does lag slightly in the middle phase, after a very strong start but picks up for a rousing although necessarily CGI heavy, send off. Most loose ends are tidied up and the stage is set for X-Men the “middle years”. Whether audiences need another rebooted comic book franchise, remains to be seen but this is quality fare and certainly no quick cash in. Yet another comic book blockbuster but representing solid entertainment, with some fine character recreation, excellent effects and an unusually strong storyline.